Love playing with kids? Now you have the chance! After a refreshing reading week, it’s time to have some fun with kids! 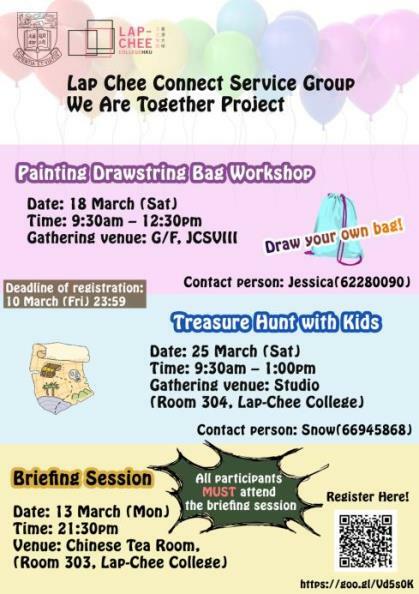 The Connect Service Group, Lap-Chee College, is organizing a String-bag workshop and a Treasure Hunt with the Child Care Service department of Caritas Hong Kong (香港明愛) on two consecutive Saturday mornings. Remarks: You are strongly recommended to join both events. Residents who register for both events will be prioritized.